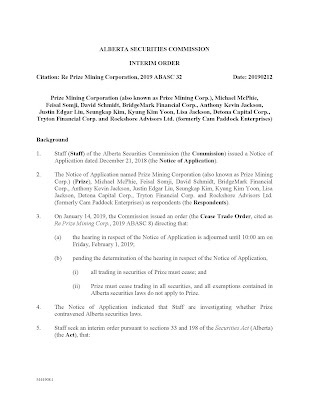 Michael McPhie, Feisal Somji, David Schmidt, BridgeMark Financial Corp., Anthony Kevin Jackson, Lisa Jackson, Justin Edgar Liu, Seungkap Kim, Kyung Kim Yoon, Detona Capital Corp., Tryton Financial Corp. and Rockshore Advisors Ltd. (Cam Paddock) were named in the Prize Mining (PRZ.v) kickback scheme. 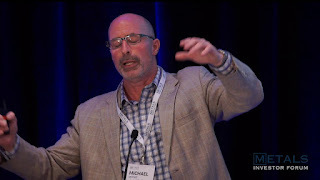 Embattled Micheal McPhie of Prize Mining (PRZ.v) has filed audited financials and they reveal he has recovered $ 1.1m of the $ 5.4m in kickbacks to the BridgeMark group. Regardless, it's a $ 7.4m loss for the year ended August 31 and those numbers reek of gross excesses in fees and outlays to insiders. Outstanding shares have multiplied 2.5 times. Micheal McPhie's copious spewing, on video, means proof of his deliberately misleading the public can't be disputed. "the $6.5 million financing that closed in the July Financing were conditional on Prize entering into 18 consulting agreements (the "Consulting Agreements") with various parties; Immediately upon receipt of the proceeds of the July Financing, aggregate consideration of $5.5 million was to be paid by Prize to the parties to the Consulting Agreements; Some of the investors in the July Financing were directly or indirectly parties to some of the Consulting Agreements; and A number of the Consulting Agreements purported to provide Prize with the same or similar services. So there we go. McPhie admits he deliberately misled his investors and the public. The paper may trade soon, although one wonders who in their correct mind would touch anything to do with a securities mutt of Mr. Micheal McPhie's caliber.